Yes, it is finally here. Not the big feature that, for a few years now, you've all been waiting for, we know that. But still, it is quite something: our brand new Message Center. A redesign of the old mail centre had been in the pipeline for over 2,5 years, so it was time to create something new that lived up to your expectations on what a good message center would bring. The new centre allows filtering in categories, a properly working outbox and, overall, a new, fresh look that will help to keep Airline Mogul up-to-date with current web standards. Also, as a bonus you may already have noticed, we have implemented Rich Text Editing in Airline Mogul, meaning that from now on, you can send messages and create forum posts with images, hyperlinks, formatted text and even smilies ! With the new Message Center, you can filter your incoming messages in 5 categories for 'normal' airlines, and 7 categories for brokers. These categories include Alliance, Aircraft Sale and Lease and Player-to-Player messages. It allows you to view all messages in a category, in a clear and organized system that allows you to make most of all these incoming messages. No need to switch from the inbox to another screen to read a message. This system has it all, in one screen, for easy navigation and better oversight. Obviously, basic functions you all knew and loved, like the delete checkboxes, have been retained. With this being an entirely new function, coded from scratch, there is always the possibility that some bugs are present. If so, please let us know so we can fix it! Just send an email to to let us know about the issue. The main known issue is listed below, in the Frequently Asked (or to-be-asked) Questions. Have fun using this new feature, and don't hesitate to post in this thread to let you know what you think of it. Please note that all the functionality currently present in the Message Center is only there for the coming three weeks, while I am on vacation in (hopefully sunny) France. After three, maybe four weeks, when all users have had the time to familiarize themselves with all the functions the new Message Center has to offer, we will make it a Premium Feature. With the Premium Feature enabled, it will be possible to filter messages by folder, and more! The full list of Premium Features will be announced shortly. 1. Why this, when we all want hotswap? Don't you have other things to do? Actually, yes, we have other things to do. A feature like this takes me just over a week to properly build, being at home all day. A feature like hotswap takes a lot of time to create, if you want it to actually do what it should do. Besides, the mail centre was hopelessly outdated, so we did that first. 2. When I click Player Messages, it doesn't return all Player-to-Player messages! True. That's because it only works for messages sent with the new Message Centre. In a while, it will work better, because people are, from now, using the new Message Centre instead of the old mail centre. 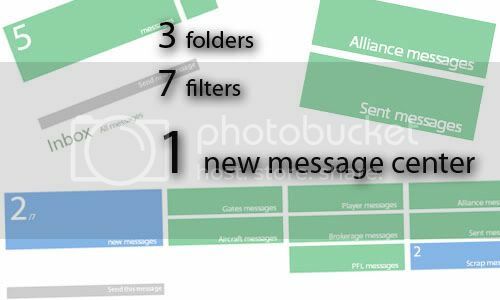 For it to work on messages sent with the old mail centre, we would have to go through all of the worlds, changing folders for all Player-to-Player messages, which basically took us too long. 3. When I click on Sent messages, I see garbage bins behind some messages. That's because the user you sent the message to, deleted this message from his own inbox. We have kept it in your outbox, mainly because we figured you'd like that. Later on, we'll allow users to delete files from their inbox without deleting the message in the recipient's inbox. 4. I've spotted a bug! Sorry 'bout that! Please let us know via . 5. I found the Send new Message / Reply page, but I don't know how to actually send the message I entered. You'll notice that the Send new Message button has turned into the Send this Message button. Just click it, and the message will be sent. It's really that easy! 6. I like the new error and confirmation messages, but I can't get them off my screen! That's why they have a Close button (The X ). Click that button, and the message will close. BETATEST THE NEW VIEW ROUTES! Back after a year-long break! Re: New Message Center - Launching Friday 07-22-2011! Re: New Message Center - Launched! We've launched the new message center! It's live in all worlds from now! Please check the first post of this thread for more information. Woah! The mail center looks awesome, but it loads really slow. Is that supposed to be like that? There may be an initial hang that I've seen but otherwise its snappy. Initially it may load slow because of the custom font, but as soon as the font is in your cache it should be quite quick. Not to be OT or rain on the parade, as the new messaging system is definitely an improvement....but this hotswap option hopefully is being looked into during your spare time. from now on, you can send messages and create forum posts with images, hyperlinks, formatted text and even smilies ! Wow, I just noticed that I could send smilies! I am so happy for the new message centre! What would AM be without you guys? I can't thank you enough! Btw, what are the premium features, and when are they coming? In Google Chrome you can resize text boxes (like the reply box below), but with the new formatting it is not possible any more. I like to make the box bigger, as the current size is extremely small. The forum has both formatting and ability to resize, is it possible to make resizing again? Thanks!